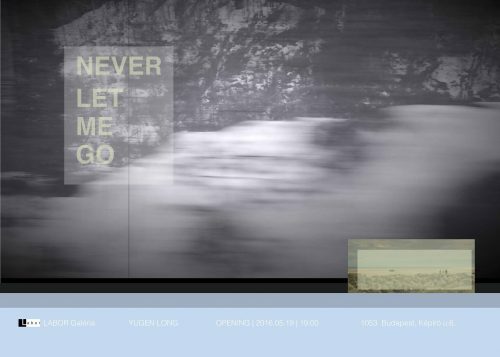 Labor Gallery presents the solo show ‘Never Let Me Go’, which title comes from a 2005 dystopian science fiction novel by Japanese-born British author Kazuo Ishiguro. The exhibition attempts to restore a way to reproduce a scene from the novel in virtual reality, and explore the relationship between soul and personality, as the space triggers visitors to think about humanity and morality. The fictional story begins with Kathy, a carer, talking about looking after donors. She has been a carer for almost twelve years at the time of the narration, and she often reminisces about her time spent at Hailsham. Hailsham is a fictional boarding school in England, where the teachers are known as ‘guardians’. Along with classes, they often emphasize the importance of keeping the health of their students. For instance, smoking is considered to be a taboo, almost on the level of a crime. The curriculum appears to be like that of any other school, but there is great encouragement for the students to produce art. The art is then displayed in an exhibition, and the best artwork is chosen by a woman known to the students as Madame. The students speculate that she keeps their work in a gallery. The story revolves around three Hailsham students, Kathy, and two others, Ruth and Tommy, who develop a close but complicated friendship. Kathy develops a fondness for Tommy, looking after him when he is bullied and having talks with him beside the pond. However, Ruth and Tommy begin a romantic relationship during their time at the school that continues when they leave. In an isolated incident, Miss Lucy, one of the guardians, talks to the students about their goals and their true purpose: to provide organs to others, a cycle of “donations” that will consume their lives. This results in Miss Lucy’s removal from the school, though it causes only subtle disturbance in the students, who were raised with the notion. Yugen Long’s paintings are composed with simplified geometry forms, he is using common elements from life as materials. When creating these works, he experimented with the original properties of the material, explored a simplified geometry of forms to reconstruct a form of beauty and relationship. His installation uses experimental materials and elements: 3 leaves of grass, 4 leaves of grass and salt. He uses the titled to create a space and relationship with the memory of the elements, to explore them through imagination and virtual reality. (b. 1991, Chongqing, China) lives and works in Milan, Italy.